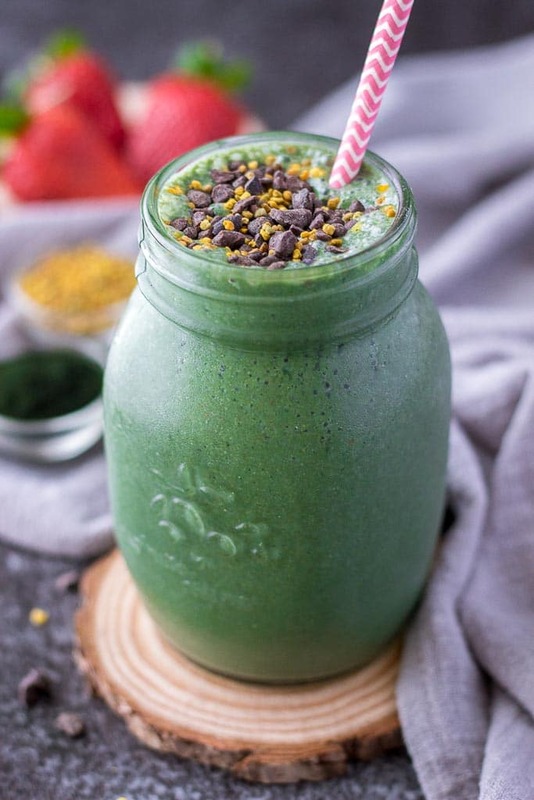 Strawberry Spirulina Smoothie - Green smoothie perfect for mornings! Oh man, you think at some point you can actually get fed with strawberries, but hey… that’s not the case with me. Nope! I’m super obsessed with strawberries. I’ve been obsessed since the first day they appeared on the market. And I can only guess my obsession will continue until the end of the season… maybe a bit beyond. In a very short time, I had like a ton of fresh strawberries. I already devoured a few Strawberry Chia Puddings with my husband. And my kiddo was super excited the other day when I made him Strawberry Banana Muffins. This weekend I’m planning to bake a bunch of Strawberry Oatmeal Cookies for next week. You see… that’s not quite normal. But what can I do? Strawberries are one tempting little delights. My favorite way to have fresh fruits in the morning is to make a SMOOTHIE. This amazing green Strawberry Spirulina Smoothie recipe is actually one of the first recipes I shared on my blog back in 2016. It still is one of my favorite smoothie recipe EVER. It features delicious fresh strawberries and sweet banana but also some powerful SUPERFOODS also. The original recipe was quite plain so over the years it kinda evolved to this goodness. Strawberry Spirulina Smoothie will delight you even if you’re not a big green smoothie fan. It’s unbelievably sweet but made without any added sugars, creamy and dreamy, thick and so drinkable. + It’s loaded with all that body needs in the morning – fibers, high-quality PLANT proteins, healthy omega-3s, and many MANY essential vitamins and minerals. A nutrient powerhouse. Perfect healthy breakfast smoothie. Banana: Ripe banana is the best choice here. It will give the smoothie amazing creaminess but also sweetness so you don’t need to add extra added sugars later. If you like your smoothie EXTRA creamy, you can use a frozen banana. Milk: Almond milk is the best choice for making this strawberry banana smoothie. It’s mildly sweet with a hint of nutty flavor which pairs nicely with fruity banana and strawberries. I don’t recommend using cows milk or coconut milk here. Smoothie won’t taste nice using those milk. You can sub almond milk for organic soy milk. Ceylon cinnamon gave this unbelievable scent and beautiful flavor. Hemp seeds are loaded with healthy fats. They are exceptionally rich in two essential fatty acids, omega-6 and omega-3 but also a great source of high-quality proteins (1). You can definitely swap hemp seeds for chia seeds or flax seeds here. Use one you have at home, and the one you prefer. Baobab powder boosted this strawberry banana smoothie to a whole new level, adding citrusy flavor but also fibers and a whole lot of vitamin C – a powerful antioxidant and immune booster (2). There are many stars in this beautiful smoothie story, but maybe the greatest are STRAWBERRIES, spinach and of course SPIRULINA. Strawberries: Strawberries are low-calorie fruit that is sweet and just delightful. But what’s making strawberries so delightful is not just sweetness but the fact that this little fruit is loaded with vitamin C – powerful immune boosting and healthy skin antioxidant (3). Fresh strawberries are the best here, but frozen will work fine too. If you’re using frozen strawberries, you might expect creamier and dense texture so you’ll probably need to add extra liquid – milk. Spinach: Spinach is one powerful green. And by powerful, I mean POWERFUL. It’s a nutrient-rich vegetable containing high amounts of carotenoids, vitamin C, vitamin K, folic acid, iron, and calcium (4). When making smoothies, I like to use baby spinach. It’s delicate and mildly sweet. Perfect for making green smoothies. Spirulina is a type of blue-green algae that grows naturally in oceans and salty lakes. 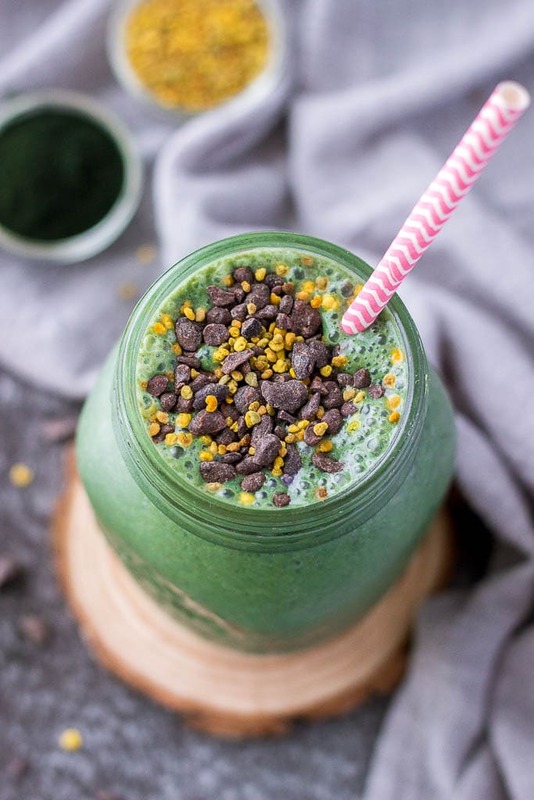 Yeah, I know… the thought of adding algae into your drink… kinda gross BUT spirulina is a superfood with many nutrients and many MANY health benefits. It’s really worth trying it out and sees if it can fit in your diet. Well, honestly it’s not the tastiest thing I ever tried but you can mask its intense veggie green, slightly earthy taste combining spirulina in fruity drinks like this Strawberry Spirulina Smoothie. Trust me, you will not even know it’s in there. This Strawberry Spirulina Smoothie is ALL NATURAL, made with fresh wholesome ingredients, and boosted with powerful superfoods. It’s loaded with nutrients – fibers, plant-based proteins, heart-healthy fats. It’s also vegan and added-sugar-free – naturally sweetened with ripe banana and strawberries. It’s rich, creamy and amazing! It’s one of those green smoothie recipes you may be a little intimidating to try, but you end up not regretting one single bit. An easy, healthy, and super tasty Strawberry Spirulina Smoothie that's loaded w/ good for you ingredients like SUPERFOODS and fresh fruits! It's vegan and added-sugar-free. Add all the ingredients into your blender and process until smooth. Add more milk if smoothie is too thick. Pour in glass and add toppings: cacao nibs, bee polled. Drink immediately. As a measure, I used UScup(240ml). Add honey or maple syrup to sweeten smoothie, if you like. For VEGAN: omit bee pollen as topping. *** This recipe was originally published on May 05, 2016 and was updated on April 09, 2019 with new photos and upgraded recipe. Mmm a delicious way to start the day for sure! I have never heard of Baobab powder but after reading the citrus flavor notes and benefits I think I need to try it!! Beautiful and healthy smoothie! I am a big fan of a strawberry smoothie but never tried with spirulina. I would love to make this soon. I love the whole idea about this strawberry banana smoothie with spirulina! It looks so gorgeous and flavorful! I also love the shape of that sweet mason jar. It makes serving and enjoying this recipe so happy and inviting!